Takeoff and landing: El Berriel airfield, Tarajillo. Pick up and return to the hotel included, passport and identification required. 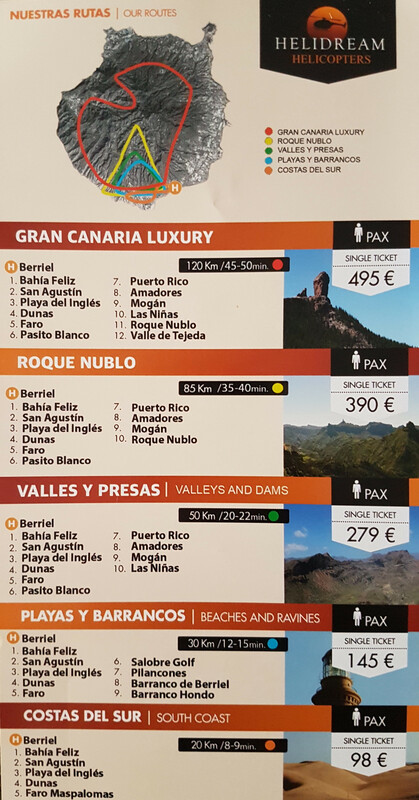 Collection included in the price from Bahia Feliz to Maspalomas. For the rest, the cost will be informed at the time of booking. Helicopter model: Bell 206, Pilot + 4 seats. 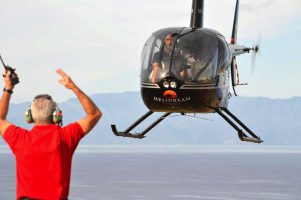 In order to properly distribute the helicopter ticket, it is mandatory that people over 110kg reserve 2 seats. The price of this seat is reduced to 50%. HOW ARE THE SEATS ASSIGNED? Unless they book the helicopter exclusively as a private flight they will share the flight with other passengers. We try to place couples and families together. The distribution of seats in the cabin will be appropriate for the correct weight balance following the characteristics tables of the aircraft.